Caution: Do not consume any chicken of the woods unless you harvested it from a deciduous tree. Those growing on yews, conifers or eucalyptus may absorb some of their oils which can cause serious distress. 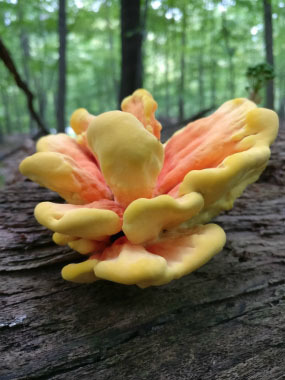 Overview: Chicken of the woods is parasitic and saprobic on living and dead oaks (also sometimes on the wood of other hardwoods). It causes a reddish brown cubical heart rot, with thin areas of white mycelium visible in the cracks of the wood. It is considered an annual favourite. These mushrooms do not appear until well after the fungus has attacked the tree. Originally described in 1789 by French botanist and mycologist Jean Baptiste Francois (Pierre) Bulliard, this spectacular polypore was given its current name in 1920 by the famous American mycologist William Alphonso Murrill (1869 - 1967). This fungi typically grows in large clusters in the summer and fall. 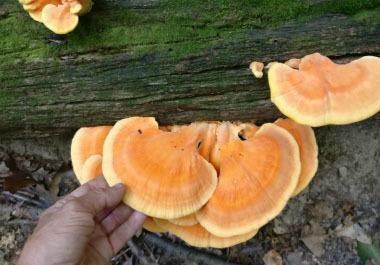 Distinguishing Features: Chicken of the woods is fan-shaped to semicircular (or irregular) and it can be smooth to finely wrinkled with a suede-like texture. Fruitbodies are bracket-form, broadly attached with yellow, round pores. The cap measures anywhere from 5 to 30 cm across and up to 20 cm deep; up to 3 cm thick. It is bright yellow to bright orange when young (sometimes it can develop a reddish tinge) and it often fades when mature. The flesh is thick, soft and very watery when young. It becomes tough, eventually crumbling away. Height: This fungi does not have a stem so there is no height. 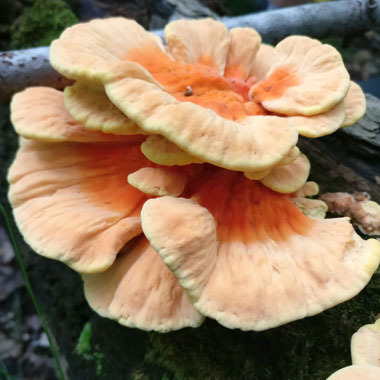 Habitat: Chicken of the woods is found growing on or at the base of dead or dying hardwood trees; most commonly on oak but also cherry or beech. It can also be found on dead conifer stumps. Chicken of the woods has been known to fruit on living trees as well. This bracket fungi is found throughout Canada, U.S., Europe, and parts of Asia. Spore print: The spore print is white (sometimes slightly yellow) but it is a little difficult to obtain as the caps aren't so distinct. Season: Summer and autumn. Sometimes, specimens of this large polypore persist through the winter and are able to continue fruiting during the following year. Gills: There are no gills; underneath the brackets there are tiny round or oval tubes - typically 2 or 3 per mm and 15 to 30mm deep. The pores are pale yellow and sometimes can be white. Edibility: This mushroom is said to have a lemony, meaty taste. Some think it tastes like its chicken namesake; others describe the flavour as being more like crab or lobster-like. 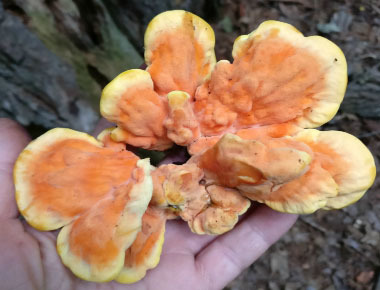 The margins of chicken of the woods is the desirable part to consume because the inner area tends to get a bit corky or in some cases woody and requires boiling in water for about an hour. 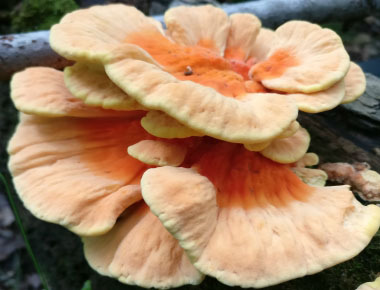 Its look-a-like, Laetiporus cincinatus (pores are white and it grows from wood in the ground), is totally palatable. It’s important to note that this is one of those mushrooms that sometimes can cause gastric distress in certain people. If you want to avoid a possible stomach ache, only try a little bit your first time to see what it does to you. Be sure to cook before eating! A big thank you goes out to Angel Zimmerman of Ohio who provided EdibleWildFood.com with the images to make this post possible. To enjoy her photography you can follow her at Instagram (angelzimmerman70) or at Twitter (@FungiAmongi).